Last winter I wrote about my excitement with teaching in an active learning classroom on my blog. 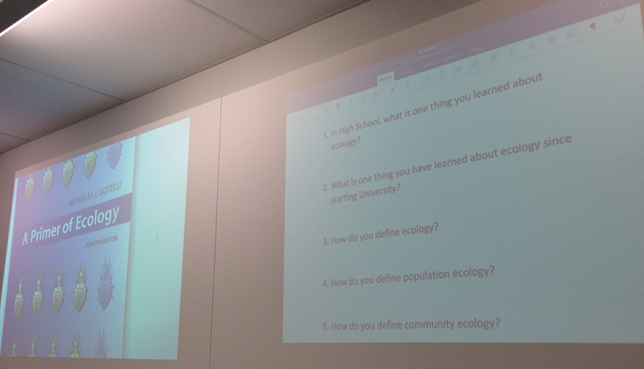 As a quick refresher, my course had just over 80 students, and is an introductory ecology class. The course has a strong focus on quantitative approaches to population and community ecology, from equations to modelling. I gave up doing traditional PowerPoint slides for this class a long time ago, but until this term, I was still teaching in a theatre-style lecture hall. With continuing to push the “active learning” agenda, it was great to have an opportunity to teach in a classroom specifically designed for active learning! 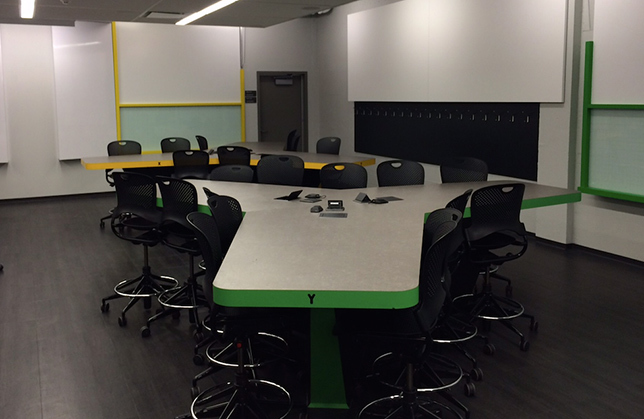 The active learning classroom. Photos by Chris Buddle. So, here are some perspectives and thoughts about teaching in an active learning classroom now that term is over. I found the tables (with rolling chairs!) were especially great when I did in-class quizzes, especially with group-based problems using “IF-AT” cards. Given the configuration of the tables, I sometimes did the quizzes with two groups at each table (so, 14 groups total, with 4-6 students per groups), or sometimes with three per table (21 groups total). Because the tables had three “wings” and chairs that rolled, it was quick and effective to make groups for these quizzes. Students working in group quizzes using IF-AT cards. The configuration of the room made it feel like a ‘small’ class even though there were over 80 students in the room. From what I understand, a lot of care and attention was taken to the acoustics in the room, and I was truly amazed that even with active group work, the noise level was not overwhelming, and groups could work effectively. Almost every class this past term included some kind of peer-to-peer discussion. 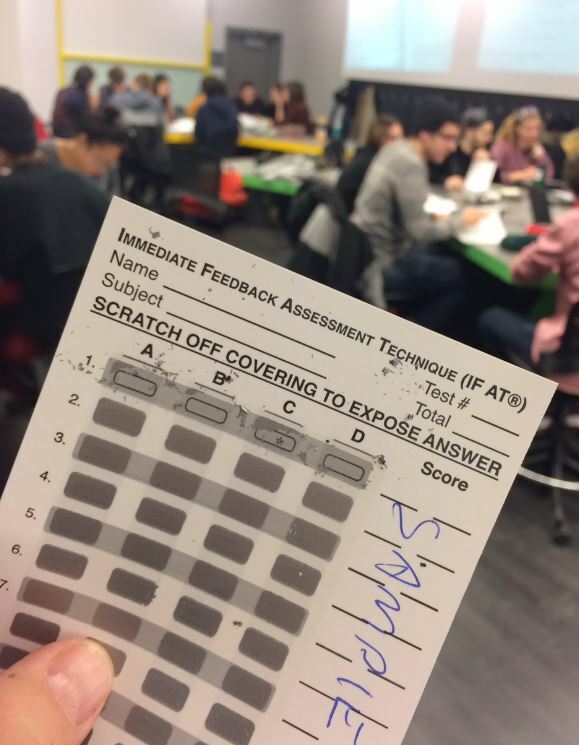 Because students were facing each other, this was easily done in an active learning classroom: quick problem solving challenges, or getting students to come up with real-work examples related to course content, all was done easily on the spot. In a large lecture theatre it’s clunky and difficult to form discussion groups. A key strength of the active leaning classroom is certainly the configuration of tables: the learning space is optimal for active discussions. I used some, but not all, of the technology in the room. The tablet was fantastic (but see below…) and allowed me to write and draw, and those notes would be projected on one of the screens. At the end of lecture, the slides were immediately posted as PDFs on the course website. The room actually had dual projectors, and I used the second screen with a document camera so I could project graphs or text from the course textbook: students therefore had the course content from the textbook and from my lecture notes on the screens, during lecture. Although the room was also equipped with screens for each of the tables, I didn’t use these much, but the potential for each group to project their work has great potential. Another advantage of the room was that the walls next to all the student tables were whiteboards. 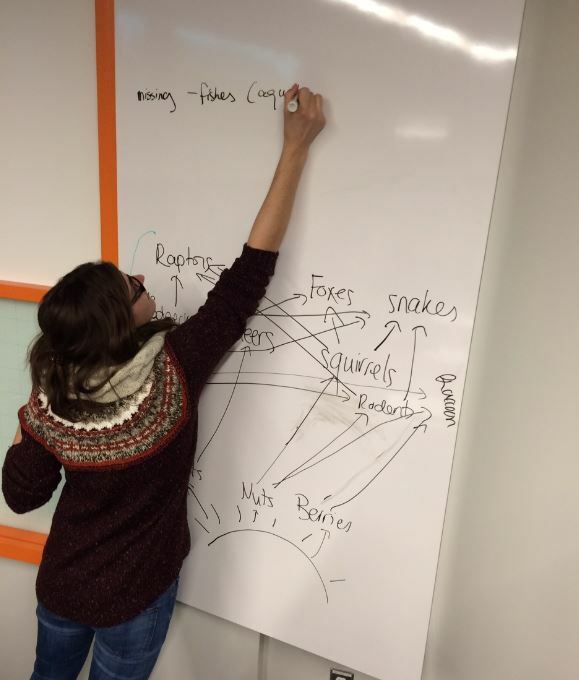 This allowed groups of students to work on problems using markers on the whiteboard, and draw out answers to problems, or do things like create ideas about food-webs. Again, the configuration of the room made this very quick and easy, since the students were just a few feet away from their whiteboard. Students using the whiteboard to make food-webs. Sometimes you just need to lecture, and an active learning classroom isn’t set up very well for more traditional lectures. Active teaching and learning can be exhausting for the teacher and the students, and sometimes the content really lends itself well to a more traditional lecture. The active learning classroom and its configuration means that a third to a half of the students aren’t facing the podium (which is in the middle of the classroom), and it can feel quite awkward lecturing in that kind of room. I also bring in guest lecturers throughout the term, and it can be daunting for a guest lecturer to be inserted into an active learning classroom (although I briefed them on the layout, it is still difficult to fully grasp the classroom until you actually teach in it). When I sat at one of the desks (as a student would) during the guest lectures, I also discovered another problem with the room: you don’t know where to look. There are dual screens in four different corners of the classroom, and the teacher is standing in the middle of the room, not in front of any of the screens. I can be a bit weird and unsettling. Students have told me about this quirk of an active learning classroom, and after being a student in the room, I get their point. Although I listed the whiteboards as a “pro”, above, they also get labelled a “con” because of their configuration. Since there were only seven tables and one main whiteboard for each table, it got crowded around the whiteboard when students at each table worked together on the whiteboard. Group work with 12 students is really tricky. When technology works, it’s wonderful. When you rely on this technology, and it fails, it can spell disaster. Towards the end of the term the tablet pen stopped working and this happened in the middle of a class (of course!). This meant I had to quickly change strategies, and I used a sheet of paper under the document camera, and wrote the class notes in that fashion. It was less than ideal, and was frustrating for me and for the students. And, it meant I couldn’t get the notes transferred to the course website. The IT folks did get this fixed, but there were a few classes where I had to adapt on the fly. In sum, the experience of teaching in an active learning classroom was very positive: students seem engaged, and the room was well suited to group activities. As with all teaching, everything takes practice, and I know it will be much smoother next time I teach in that room. The space is really impressive, and I certainly did not use the classroom to its full potential. If you want to dabble in active learning in your own class (or other approaches, such as flipped classrooms), I do highly recommend trying to teach in a classroom space that is conducive to your style of teaching . That being said, it’s a very bad idea to teach a traditional podium-style lecture-based class in an active learning space: it just doesn’t work, and under that scenario, stick to a theatre-style classroom. I also want to give a big shout-out to teaching and learning services at McGill – brilliant minds in that unit worked on the design of the room I taught in this past term, and after spending a term in that space, I am in truly in awe. Well done to the TLS team! And thanks to McGill for supporting active learning classrooms across its campuses. This article was originally published on Christoper Buddle’s blog, Arthropod Ecology. A nice article, I am pleased to see that this classroom is still attracting professors and students alike to explore new ways of teaching and learning. I would like to use this opportunity to also highlight the other project team members that worked together to make this project a success.